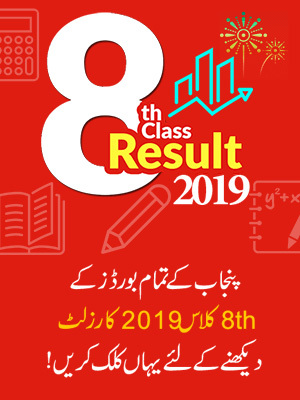 According to Board Officials BISE DG Khan Board 10th Class Result 2019 will announce on 21 July, 2019. 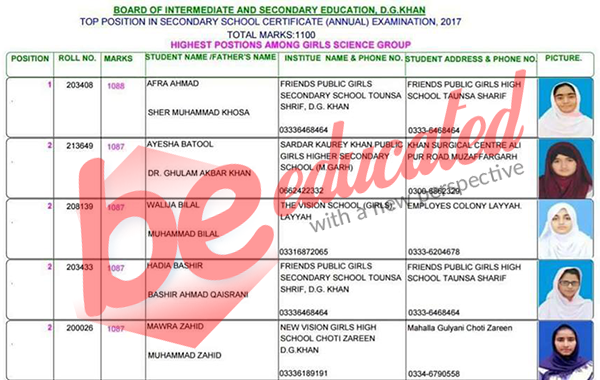 Board of Intermediate and Secondary Education DG Khan has announced the result of matric 2019 and the Chairman of the board has also declared the position holders in each group who have marked the success among their name. The Chairman of BISE DG Khan Board led the press conference and declared the names of the students in the list of top three position holders. In science group the position holder students among boys Muhammad Amir with 1089 marks led the first position, Muhammad Abdul Rehman with 1086 scores remain on number 2, while Muhammad Owais Hameed Qarni with 1084 marks plunged 3rd position in matriculation. While among girls in science group 1st position is grabbed by Afra Ahmed with 1088 marks, 2nd position is taken by tetra number of students naming Ayesha Batool, Walija Bilal, Hadia Bashir, Mawra Zahid with the collaboration of 1087 marks, whereas the 3rd position is sharedin between Amnah Bashir and Maha Akbar Baloch with equal scores of 1083 marks. However in General Science group, among boys Muhammad Adnan clinched 1st position with 939 marks, Muhammad Umar with 915 marks grabbed 2nd position, and Bewargh with 904 scores stayed with the 3rd position. 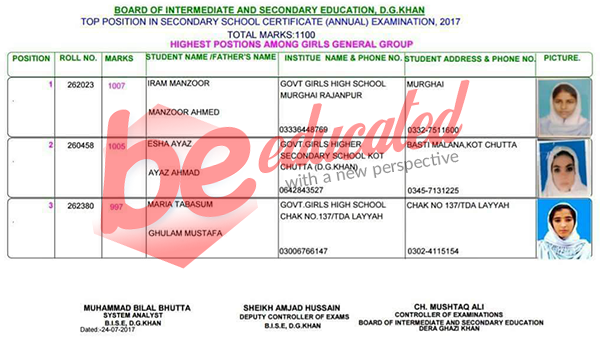 In General Science group among girls Iram Manzoor stood with 1st position in the board of DG khan with 1007 marks, Esha Ayaz awarded with 2nd position on scoring 1005 marks, while Maria Tabasum plunged 3rd position with 997 marks in DG Khan Board. 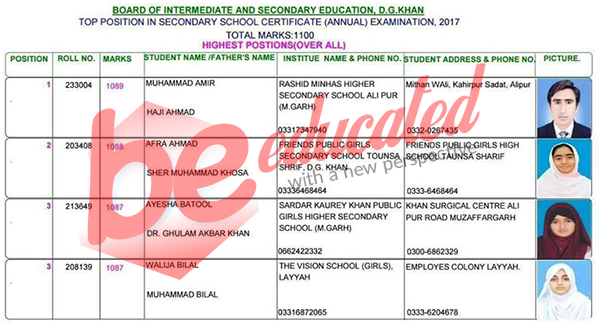 BISE DG Khan Board 10th Class Result examinations are conducted every year in the month of March. 10th Class annual exams started this year in March and completed in the month of April. Now these days all the students who were appeared in exams are waiting for the BISE DG Khan Board SSC part 2 result 2019 which will be announced in the mid of July 2019. Last year, the result was also announced in the same month. Result preparation is under process and soon the result will be announced by authorities of board. We will also upload the result and students will be able to check the result here. Board of Intermediate and Secondary Education DG Khan (BISE DG Khan)started its functioning on January 4th, 1989. The camp Office of DG Khan Board started working in the Multan Board and after that it was shifted to DG Khan Headquarters. BISE DG Khan Board was established by the education department to oversee the issues of secondary and higher secondary level education. DG Khan board follows the schedule of conduction of examination and announcement of result of every year. By offering quality education board is improving the education system in the province. We will also upload the result here for the convenience of students. 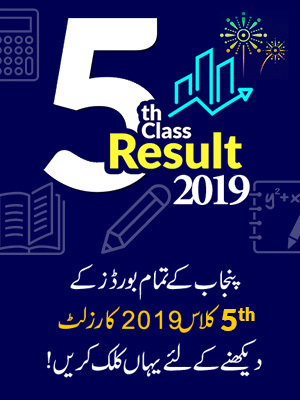 All the students are advised to stay in touch to get BISE DG Khan Board 10 Class Result 2019 that will be announced soon.The aim of BISE DG Khan is to improve the literacy rate and standard of education in the country. The affiliated zones with BISE DG Khan include the districts of D G Khan, Muzzafargarh, Layyah and Rajanpur. 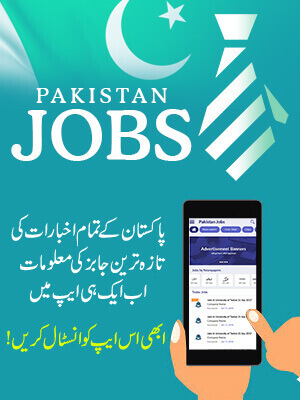 The board also has a very well managed website on which you can get all the related information regarding their policies and complaints can also be done.